Dispensing Cans permit easy, one-hand dispensing of liquids directly onto work surface. Leak proof, self-closing, brass dispenser valve minimizes spills and controls excess. FM Approved brass valves are ideal for use with flammables. Textured, high-density polyethylene body provides a firm grip. 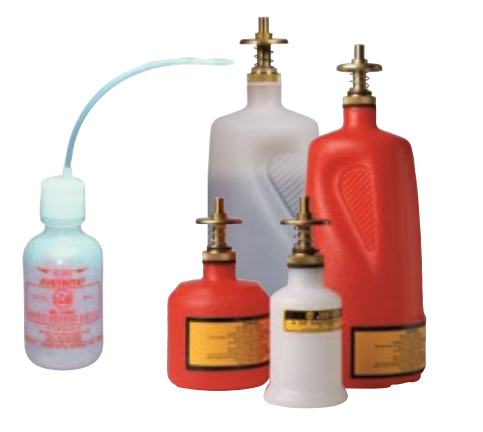 Squeeze Bottles made of polyethylene with a stainless steel wire, provide safe dispensing of flammable liquids directly on small components or sub-assemblies with a minimum of over-spray. Squeezing the bottle produces a fine stream of liquid. Stem can be shaped to dispense into hard-to-get areas. Squeeze bottles are intended for daily use only.